This dissertation investigates how and when the Dutch voicing alternation is acquired. In Dutch, final neutralisation of the voice contrast (final devoicing) leads to alternations in singular plural pairs such as bed bedden ‘bed(s)’. In such pairs, the singular always ends in a voiceless obstruent, whereas the plural contains a voiced obstruent. Knowledge of this alternation can only be acquired on the basis of the inflected form, which needs to be related to the neutralised stem. The acquisition of the voicing alternation was investigated using corpus data (based on CELEX and CHILDES) as well as experimental evidence. Experiments consisted of elicitation of both plurals and singulars for words and non­words, to investigate children’s productive knowledge of the alternation. The research was aimed at testing predictions of rule­and constraint­based models on the one hand and analogical or usage­based models on the other. 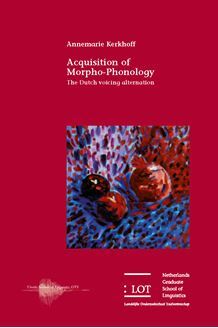 Results show that the Dutch voicing alternation is acquired relatively late and shows limited productivity, as it is not often extended to non­words. It is argued that the results are interpreted most adequately in a usage­based framework such as Bybee’s network model, in which frequency based generalisations or ‘schemas’ arise over stored words in the lexicon. This dissertation is of relevance to researchers in the fields of phonology, morphology, psycholinguistics and language acquisition.